L-R: Philip Moore, Eric Berryman, Jasper McGruder. Photo by Bruce Jackson. From March 1 through March 24. This is a show about doing time. Obviously—we can see simply from the title—that means it's a show about serving a sentence in prison. 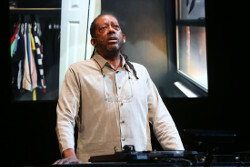 But in the hands of the charismatic and chameleonic actor/singer Eric Berryman under the subtle direction of the disciplined and imaginative Kate Valk, some other meanings present themselves. Performing music is, among other things, a doing of time. 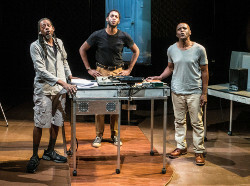 And, here, trenchantly, the performers (Berryman shares the stage with Jasper McGruder and Philip Moore) are doing what so many actors do when they render the lives or words of bygone people. They are "doing” the past to allow its spirit to show up in the present. The conceit in "The B-Side” is simple. Berryman found an obscure LP of songs sung by men incarcerated in segregated Texas prisons and he became passionate about understanding and then presenting the material as both homage and critique. The songs were recorded at a handful of separate prisons and the album was released in 1965. Part of Berryman's challenge was simply to understand the words—not to mention the references—in the lyrics, where dialects run thick and culture runs deep. Eric Berryman. Photo by Bruce Jackson. Understanding the complexities of the crushing world of the men on Berryman's LP is more daunting. Berryman treats his LP with loving reverence, removing it from its sleeve and carefully placing it on the turntable located in the center of the playing area on a sleek table in front of a single screen not much larger than a big TV. He introduces each song with its title and just enough information to let us grasp its central image or phenomenon. For instance, the "Jack of Diamonds” in one song was a guard reputedly so mean, legend had it that he told the devil, "stand aside; I'm going to rule hell by myself.” We get to hear the tiniest snippets of the actual recordings before the volume on the album is turned down and Berryman's channeling of his subjects takes over. The original voices are, indeed, thick with dialects sometimes nearly impossible to decipher. One of Berryman's virtuosic accomplishments is that he differentiates the styles and sounds of all fourteen songs and their singers while also maintaining enough of his grounding in present-day sounds to keep us from getting lost. His subjects travel through his ears and psyche and come out through his body and voice, but he can never totally collapse the distance between their world and ours. Indeed, that's not what this piece wants to do. Philip Moore. Photo by Steven Gunther. What it wants to do is suggest that ghosts from the past live with us even as we live in a wholly other world than theirs was. Projections on the screen behind the turntable and its few accouterments (my favorite is the small brush Berryman tenderly uses to clean the record each time he is about to drop the needle on each new track) are mostly images from the actor's apartment. It's spare, with little in the way of decoration or objects to tell us much about who lives there. About three-quarters of the way into the hour-long show, the three performers take a moment away from singing to rotate the screen to a vertical position, and the image of an interior, household door is projected. Gradually, the door moves off screen and is replaced by the window that lives to its left and takes over the screen. (Video design is by Robert Wuss.) It's hard to see what is outside the window, but that, too, gradually changes. An urban exterior of no particular note comes into focus as the screen moves back to a horizontal position, showing bars demarcating the panes of glass. With the window now shown on its side, the bars are eerily redolent of prison bars, and the outside, nondescript though it may be, is the ordinary that is beyond reach. 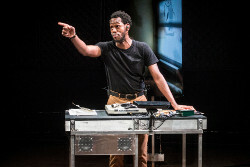 Berryman is joined in song by McGruder and Moore, whose quiet presence off to the side for much of the first half of the show, is a reminder that, as historians' overworked line goes, silence isn't absence. When they join in song, and when they finally move into the playing area and join in movement, it's also a reminder that none of the singers or songwriters on Berryman's precious album either lived or served sentences alone. There is a pristine, non-smiling essence preserved by all three performers for most of the duration of the show—almost a willed reminder that they are serving here as mediums, not as impersonators. In the show's final moment, a film clip of prisoners wielding pickaxes and chopping in unison is dropped into the middle of the screen that still shows Berryman's apartment. It's as though this black and white footage arrived from another world yet cannot be pried out of our own, even though it is something almost requiring translation. "The B-Side” provides that translation but never pretends to be resurrecting its source material wholesale. It is Brechtian as much as it is immersive; the performers are fully present as much as they are detached and in control. I think the show asks that we be the same.